Barbara Rudolph Fine Art: Jazz, Painting Birds "All That Jazz"
Jazz, Painting Birds "All That Jazz"
Do you love "Jazz"? 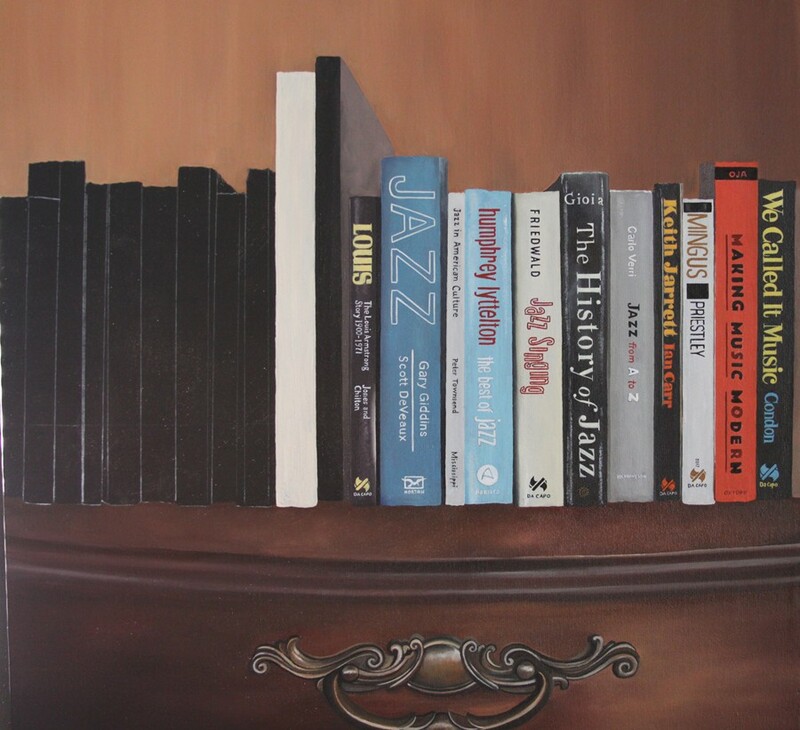 My new oil painting "All That Jazz" features many of the greatest "Jazz" musicians of all time. Louis Armstrong was a cultural Icon....the founding father of Jazz. 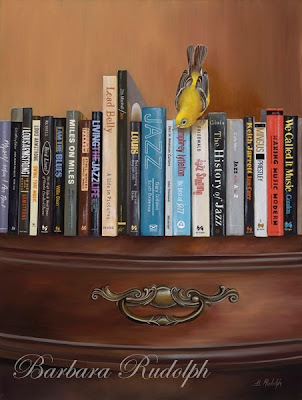 I have compiled a group of books together with one of my birds, to create a fun and interesting still life for the "Jazz" lover in your life. 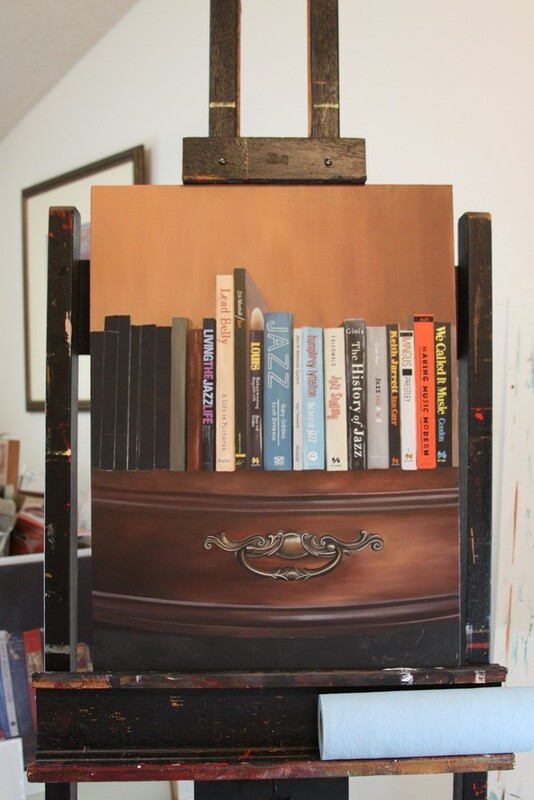 To list just a few of the books in this painting like Charlie (Yardbird) Parker. He was one of the most important and influential saxaphonists and jazz players of the 1940's. Mingus played the double bass, piano, cello, trombone and was also a composer. 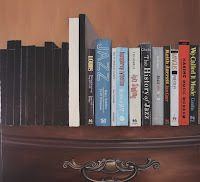 Many other "Jazz" books are painted in too like Ethel Waters and Miles Davis. This painting took many months to bring to a finish. It is 18x24 and is framed. It is available for sale now at the "Celebration of Fine Art" show in Scottsdale, Arizona. If you are in the area, please stop out to see it. You can also email me for more information about this oil painting. Your comments are always welcome. Beautiful, Beautiful, Beautiful as usual Barb!! These are a very excepitonal works. Painting Birds "Jimmy Choo Shoe House"
Cello & Bird Painting "Lemon Cello"
Mother Bird and Nest "Arriving In Style"
Murder Mysteries - Oil Painting "White Butterfly"